Flutter Scarf in Mongolian Cashmere, 2 Ply from Jade Sapphire. I used the color Candy Girl. - Free Pattern is below. Want more ruffles? Check out my Amazing Curly Scarf! Potato Chip scarf, spiral scarf, ruffle scarf - whatever you call it, this scarf is girly and cute. The first time I saw this type of scarf was in a yarn shop in New Jersey a couple of years ago. I was looking at it, trying to figure out how it was done. The shop owner said it was done with short rows. I had only briefly played with short rows at that point, and wasn't really that sure how to knit something using short rows. I was afraid to ask, and too cheap to purchase the pattern. I have now sort of figured out short rows, and came up with this scarf. There are many ways to make a potato chip scarf. Below I have some links so you can see some of the different methods - they are really all very similar and produce a scarf that looks like mine. 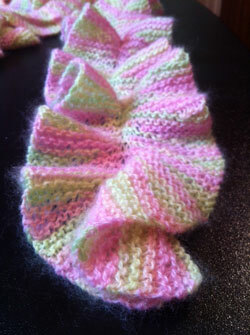 Knitting short rows creates wedges, which in turn creates the ruffles, or waves, or potato chips on the scarf. This scarf does spiral, but not quite as much as the Amazing Curly Scarf pattern I posted a while back. I did not wrap my stitches before turning, however you may do so if you like. You can find more info on short rows and wrapping and turning here if you don't know how. For my scarf, I started out by knitting a small number of stitches, then worked up to a larger number before knitting all the way across to work the other side. I left one stitch up the middle which is only knit on the full row - it is left unworked as I knit the wedges on the sides. Some patterns use over lapping wedges, others do not have a middle, unworked stitch. Some start out working more stitches and then wind down to a fewer number before the full row. I recommend playing around and trying different methods to see what you like in whichever yarn you choose to use. Keep in mind that your ruffles will not appear right away - you will be a good several inches in on the scarf before you begin to see the ruffles. And, when you bind off, the scarf will shape itself to match the cast on edge. I like to refer to the edges as bows, because that's what they look like to me. Here is a video to give you the general idea of knitting potato chip scarves. Enjoy! Knitting an eight-foot-long version of this taught me to knit backwards! After a few inches, I was too fed up turning every few stitches! It wasn't really any faster, just somehow easier. It is so pretty and fun to make. Thanks for sharing! I am going to add a potato chip scarf to my scarf collection Starting now!